You will be given a reference e-book to read which has 528 pages And the test will be based on that e-book , you can take final test within 1 year of purchase. Crisis management is an essential managerial field in which professionals specialize in handling resources, reactions, recovery and resolution of various forms of calamity. This is a diverse field, covering emergencies of legal, industrial, technical or natural natures. However, management in most crises follows a similar route formula, requiring a similar type of skilled individual to see through. Crisis management execution requires a collected, calm and analytical type of mind. Individuals specialize in crisis management really need to have a grasp of management in normal conditions, as a model to work on. They must be able to draw upon on-the-fly management tragedies under pressure, sometimes with actual lives depending upon them. In a crisis, there are several serious issues which must be managed and paced in parallel. When something calamitous occurs, the first and foremost step is in containing and responding to the immediate problem. This could simply be to halt the endangered process, or even something as critical as rescue and damage containment. Impromptu, quickly constructed plans are necessary to handle this recovery as safely and quickly as possible. This requires someone team leader management skills, and a skill for working with others under pressure. Upon completing this task, they must also manage all of the resources necessary to maintain the recovery, and to diagnosing and solving the emergency if possible. This requires human resource management skills, resource management skills and public relations skills simultaneously. The cooperation of many professionals is necessary in the face of any crisis, and it is up to the crisis management team to pull them all together. When there is no emergency, crisis management specialists often spend their time in crisis management planning. These are the contingencies, the learned emergency reaction that people are by their work to follow. These are the emergency rescue plans for natural disasters. These are even plans for if a nation were attacked, to help ensure the safety of civilians. Crisis management is a very important task, and one that is given only to those who are wise and skilled enough to serve this role. This is why work in this field requires a crisis management certification. In order to obtain this, a crisis management course must be completed. The most efficient way to do this is through online certification. Online certification eliminates classrooms, conflicting schedules and costly tuition fees. This allows busy professionals to learn at their leisure, while still fulfilling all of their personal and professional obligations. If one wishes to enter a role as important as this, is best to choose wisely which online certification provider produces this certificate. Brainmeasures is the leading company in online certification. We pride ourselves in a wide range of courses, disciplines and fields of knowledge, at the highest wallaby and with a unique, cutting-edge teaching technique. The professional course designers at Brainmeasures work closely with skilled, experienced professionals in a given field. This enables the professionals to not only be certain of inclusiveness of the course, but it also gives them a chance to distill some of the experience of these specialists. This allows Brainmeasures to imbue a level of experience upon a student that no other online certification provider can. This ensures that not only does the student have an advantage starting out, but also that anyone with a Brainmeasures certificate on their resume is a safe bet for any business firm. This course consists of the crisis management course, followed by the online crisis management exam. 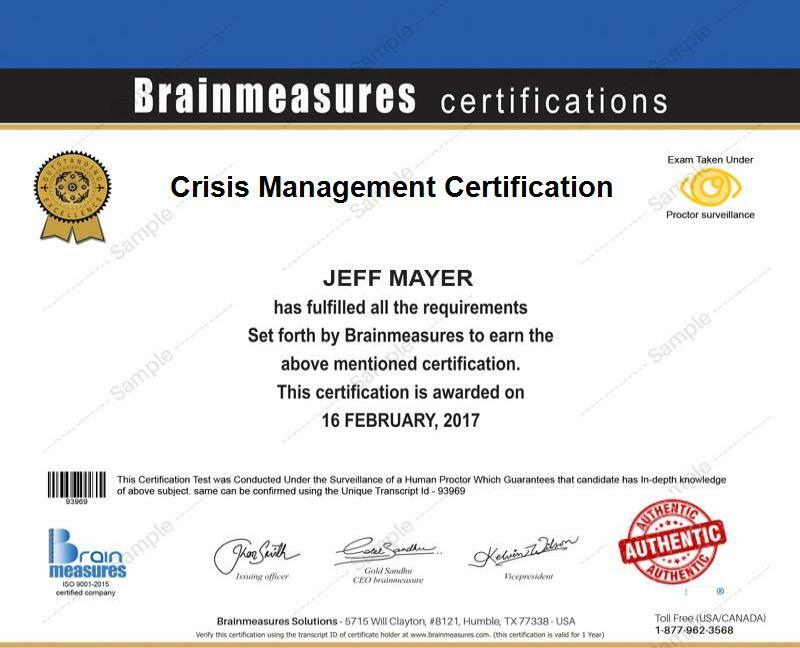 Upon passing the online rises manager and exam, a certificate is awarded signifying a complete crisis management certification from Brainmeasures. This course is designed so that anyone with a genuine interest, and the right stuff for crisis management could complete this course, and of having study properly, pass the exam. Anyone with the dedication to complete course, and truly learn the material deserves this certification. The salary range in careers related to crisis management can vary quite a bit. But if boiled down to a single set of salary ranges, the bare minimum with this expertise is comfortable enough $80,000 a year starting out. Professionals who spend time in this field often achieve as high as $340,000 a year once some experience is under their belts.